The Chesapeake Chapter focuses on implementing the U.S. Lighthouse Society's goals in the Chesapeake Bay area, particularly with regard to the lighthouses and lightships of Virginia and Maryland. Since this is a local chapter of the national organization, members of the Chapter are assumed to be - or that they will become - members of the U.S. Lighthouse Society. is a non-profit historical and educational organization incorporated to educate, inform, and entertain those who are interested in America's lighthouses, past and present. The USLHS was founded to assist in the restoration and preservation of America's lighthouses and to help qualified local groups in their efforts to return the nationís lighthouses to the public domain. To assist, in every possible way, the restoration and preservation of America's lighthouses; to continue researching the history of lighthouses, lightships and related aids to navigation; to collect artifacts and lore; to sustain a program of putting concerned parties in touch with local restoration groups; to serve as the means of communication between all who care about the preservation of these unique symbols of our nationsí maritime heritage; to maintain and constantly upgrade a comprehensive research library and photographic archives; to continue publication of The Keeper's Log, a unique quarterly journal dedicated solely to interesting historical aspects of these sentinels. 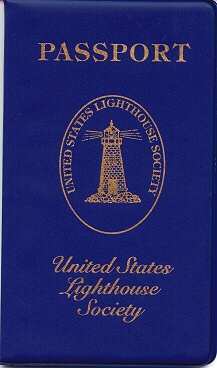 The Passports for this program are available from the US Lighthouse Society at 9005 Point No Point Rd. NE, Hansville, WA 98340. There is a $12.50 charge for the passport. Once the Passport is filled in with different Lighthouse stamps, you send the passport back and you will receive an embroidered patch the says “I’ve Seen the Light!” They also return your passport. KEEPER – $40.00 – Basic annual membership, which includes the quarterly magazine, The Keeper’s Log, the quarterly newsletter, Bulletin, and an official membership card. KEEPER’S FAMILY – $50.00 – All the benefits of a Keeper plus a 10% discount on Keeper's Locker purchases, multiple membership cards and a collectible window decal. DISTRICT INSPECTOR – $75.00 – All the benefits of a Keeper's Family, plus a U.S. Lighthouse Society embroidered patch designating your District Inspector membership. Additionally, you will receive the Society's collectible holiday ornament, handcrafted each year for upper level members. DEPUTY ENGINEER – $100.00 – All the benefits of the District Inspector plus an embroidered patch designating your Deputy Engineer membership and a custom designed U.S Lighthouse Society lapel pin. DEPUTY COMMISIONER – $250.00 – All the benefits of the Deputy Engineer along with a back issue of The Keeper's Log of your choice (learn about your favorite light station! ), a collectible Deputy Commissioner Patch, plus the glow of patronage. PATRON OF PHAROS – $1,500.00 – Family life membership. This special level of membership includes a U.S. Lighthouse Society includes all of the benefits of the Commissioner's Circle, plus you will receive a commemoration plaque, custom designed out of polished wood and brass, with your name prominently engraved, acknowledging your dedication to preserving lighthouses. International Memberships Keeper & Keeper's Family - $80.00 (plus $5.00 PayPal currency exchange fee) International Memberships include a subscription to the U.S. Lighthouse Society's quarterly The Keeper's Log (shipped via 1st Class airmail), ability to sign up for Society Lighthouse Expeditions, access to the Society's lighthouse research library, and an official U.S. Lighthouse Society Membership Card. 2011(c) Chesapeake Chapter, USLHS. All rights reserved.